Perhaps you should be more careful what you wish for. I’m not sure this picture will have the same effect on us as on those who seek to disarm us. Many of that tribe are also of the opinion that this image is simply a supra-late term abortion. Rather than being careful of what they wish for, I would settle for: be less ignorant of what you are asking for. Do you have verification that this is an original 1940s image? It’s so emotionally disturbing that I’d hate to use it only to find out that it’s a modern recreation. Not disputing that the SS wouldn’t have acted like that, but I don’t want to have this blow back in our faces like so many photo-shopped images do. IDK. Looks very clean for an original. Could well be an Oleg recreation. Certainly in theme with authentic images. There are plenty of authentic images. Much of the photography of the period was of high quality, limited more by the operator than by the technology, and so the condition of the images will be more a matter of handling and storage over time. Some of them could still be of very high quality. I’ve seen images from the 1860s that were very sharp and clean. However, we’ve now entered a stage in technology when every image, every video, every foot of old film, can now be called into question. All of history can be, will be, and is being, said to be a hoax. That’s a long-winded way of saying that truth won’t matter to most people. In fact it never has, but today pictures can and do lie, and so it’s easier to ignore even the hard evidence of the past. Technology has come so far that it is now becoming worth less, so you’d better be able to make the moral case without relying too heavily on images and statistics which can always be disputed. If the best moral arguments are rejected, then we have a more straight-up honest conflict. They’ll have to deny human rights and uphold themselves and their coercive force as the ultimate authority, rather than nit-pick over the veracity of historical accounts. They’re expert nit-pickets, so you’ll never beat them at that game. You give them a gigabyte of date, they’ll reply with a terabyte of noise and confusion. We already know how this plays out though, even if they deny, obfuscate, confuse and distract (as we know they will) all the way to and through the end. The difference this time is that we’re not all Jews, gypsies, homosexuals, retarded, etc. ; and we aren’t going to give up our guns until we use up those 1T round of ammunition.. It may be vintage, but I suspect it has been staged for the camera either way. Bullet path appears to be close to the photographer. The soldier wouldn’t want brains and blood on his uniform and face. That blanket, or coat, the baby is in appears to be very clean. The helmets appear to have different markings. From what I’ve read, they wouldn’t have bothered to waste a bullet, but would have simply crushed or smashed the child’s head. Easy, efficient, cheap. But to the people that hate private gun ownership that is a goal. They WANT the government to murder us. As long as that baby is the offspring of a gun owner/conservative, Trump supporter to them it’s a feature not a bug. 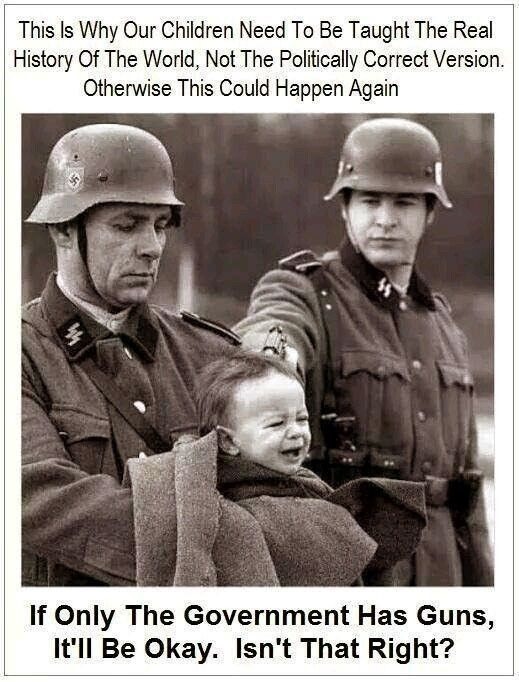 They want us dead so murdering our children is just another way to exterminate people not like them. You understand how much they hate us. You show them that picture and they would LOVE to see that happen here so long as the government is killing the ‘right’ people. They should ask Leon Trotsky and Ernst Röhm how well that works out. Got to agree with Will. Leaving aside the horrific nature of the shot and the act, I can’t imagine any intelligent person holding something in that position while someone else shot it, let alone finding another person intelligent enough to take that quality of picture who would still be willing to stand almost directly in front of the muzzle in order to do so. Again, so what? The picture is an accurate representation of what the Nazi’s were all about. And in the context of the discussion here, it is meant to show what can happen when good people are disarmed and then bad people get a hold of the powers of government. 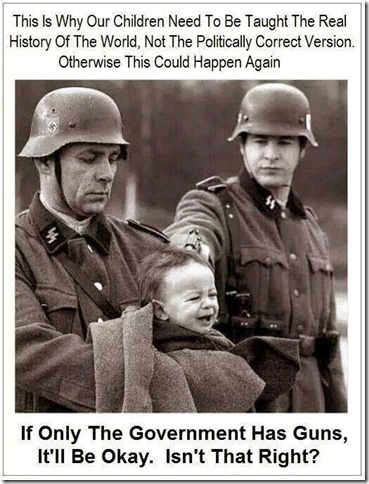 There is another image that makes the same point with a similar photo: the caption reads “I saw a movie once where only the police and military had guns. It was called Schindler’s List.” There too, the staged nature of the image wasn’t at issue; the message doesn’t depend on that.